A long-term solution must be found for the flooding problems at Mourne View Road and Burrendale Park Road, Newcastle said Sinn Féin represntatives. 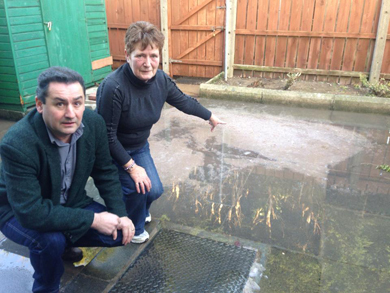 Councillor Willie Clarke with Newcastle resident Donna Feenan who experiences flooding problems in her back yard. Newcastle area Councillor Willie Clarke speaking following visits to homes in the area on Sunday morning said: “I find it disgraceful that residents have to endure this flooding… their garages and yards are being contaminated with sewage and every time it rains it creates sheer panic amongst residents. I find this current situation to be totally unacceptable. “Mourne View residents have faced years of flooding and they continually face the possibility that flooding may return, given the nature of the storm drainage system; the very least that can be expected is that a scheme is costed and designed to alleviate the problem. 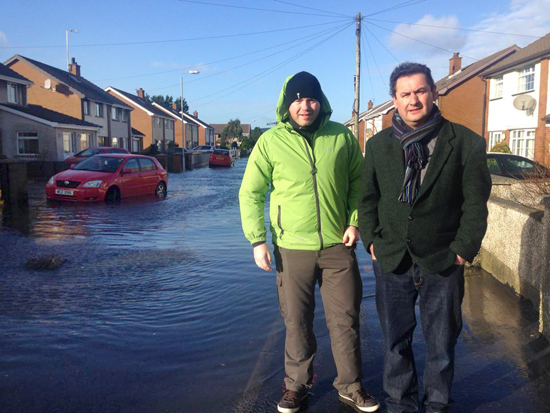 South Down MLA Chris Hazzard with Councillor Willie Clarke looking over the flooding problem in Newcastle on Sunday.